According to food historians, wild corn may have been growing in southern Mexico as early as 5200 B.C.E. , while cultivated corn may have appeared as early as 3400 B.C.E. Corn was so sacred to the Mayans that they used human blood to fertilize it. Columbus was introduced to corn by the Arawaks in the Caribbean, and when settlers arrived in the New World, the native Americans taught them how to cultivate and cook corn as well as grind it to make cornmeal. In Europe, corn never became popular for more than animal feed except in isolated pockets, such as northern Italy, where polenta is a dietary staple. Sweet corn, of which there are many varieties, is the type of corn served on the cob and preserved by canning and freezing. It is picked when immature while the kernels are still sweet and juicy. Field corn (also known as dent corn) is picked when mature and starchy, then dried. 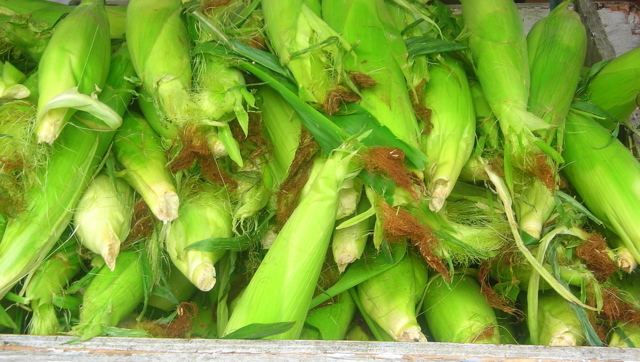 Over eighty percent of field corn in the United States is used as livestock feed; the remainder is used in processed food and drinks, as well as non-food products such as plastic and fuel. Popcorn is a field-type corn with a very hard hull. When heated, the kernel’s internal moisture becomes steam and because the steam has nowhere to go, it causes the kernel to explode. Indian (or flint) corn, with its multicolored kernels, is the type used as decoration in autumn. Blue corn, which was nearly extinct in this country in the 1980s, is now a featured ingredient in tortillas, cornbread and pancake mixes, and is also sold as cornmeal. Preheat the oven to 375 F. Butter a Pyrex baking dish or casserole. Melt unsalted butter in a large skillet over medium heat. Add the shallots. Sauté until the shallots have caramelized, about 2 to 3 minutes. Add the corn and paprika. Cook, stirring occasionally, until the corn is heated through, about an additional 3 minutes. Check seasoning. Stir in parsley. Whisk the eggs and milk, along with a pinch of salt. Pour over bread cubes in a bowl. Add the corn mixture and transfer to the casserole. Top with grated Parmesan cheese. Pour over the light cream (or half-and-half or milk, if using). Bake until puffed and golden brown, about 40 to 45 minutes. Let rest for 5 minutes, then serve at once. 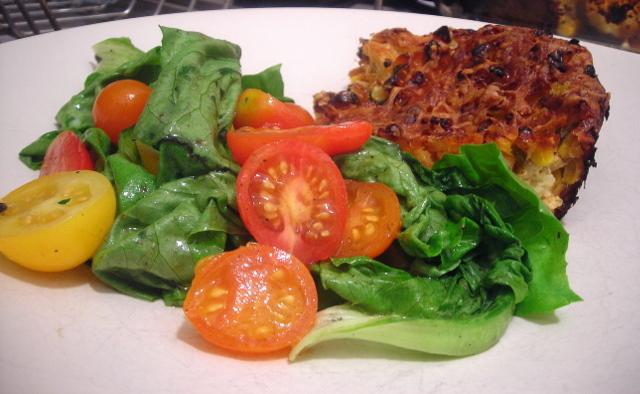 Makes 6 side-dish servings (or 4 generous helpings for a light lunch). Wonderful with a green salad — as pictured here, with butter lettuce and sliced heirloom tomatoes in a white wine viniagrette. Time: One hour (includes prep time). This will be my entry for Weekend Herb Blogging hosted by Susan from The Well-Seasoned Cook. 11 Oct	This entry was published on October 11, 2009 at 5:24 pm. It’s filed under autumn, food, general, vegetarian and tagged bread pudding, cooking, corn, lunch, recipe, shallots, vegetarian. Bookmark the permalink. Follow any comments here with the RSS feed for this post. lovely thing, corn. I used to grow some, and home grown corn was beyond words. it’s a wonderful thing. corn from the farmer’s market is a nice compromise. I picked up 5 ears for $2.50, way more than enough for me. That’s a really gorgeous and creative way with corn. I haven’t had bread pudding in ages, and never as a savory. Hmmmmmm…. Thanks, Stash, for your WHB recipe! Thanks Susan. Let me know how it turns out. I left the pudding in the oven 5 minutes too long — it’s not supposed to be that browned. I love you. And I love bread pudding. And I really love savory bread puddings. Well, I don’t know what to say! Heh. Thanks I think. It’s possible I might have underestimated the amount of liquid needed or left the pudding in the oven too long. It wasn’t as moist as I’d have liked. Oh well, better luck next time.